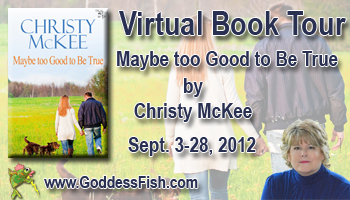 Welcome to my stop on “Maybe Too Good To be True” Blog Tour hosted by Goddess Fish. of a swoon worthy hero. his ice blue eyes are fixed on me—after all I am the heroine in this story. where Stella and I go with Colby, we feel perfectly safe with him at our back. silverware to use with each course. same. Colby does all of these things except for the smart car. Kindness is important in our lives today. than likely my hero will score a few more before day’s end. never fit into his world of power and privilege and has no desire to try. I kept nodding as I read through your listing of 'swoon worthy' qualities for a hero. Now we just need ALL men to keep to the list. Yes, a hero doesn't always have to have great muscles and gorgeous eyes, but I wouldn't mind that! LOL…you have listed superb assets which could define hero. I'll be interested to follow Gabrielle's story. You just put in writing everything I always wanted in a hero. I wish I had the ability to say it as well. I agree with MomJane. Everything on your list, is what I want in a hero, even if it's only between the pages of a book. I had a lot of fun following your blog tour. I wish you continued success. I am so glad to be here today. This is the grande finale of my month long tour to promote Maybe Too Good to Be True. What a fabulous place to finish! That would be quite a challenge. Instead of overwhelming men with "the list" maybe we could encourage them to adopt one trait at a time. I wish I could find lots of heroes with those qualities–in the pages of a book or in real life. Thank you for taking this journey with me. Hopefully when the next one comes out, we can meet again! Your are right. There is a lot to be said about a man who loves you when you're sick and scruffy or having a bad hair & face day. Men should get triple kudos for those times. Nice list of swoonworthy qualities–Colby sounds like a keeper! Those are all good qualities for a hero to have. Your post grabbed me right from the start as my hubby is six foot four and was thirty-something (34) when I first met him. He possesses many of those swoon-making qualities. My husband is 6'3" and played college football. He has many of the "swoon" qualities and honestly, he seems to be getting more of them as he grows up. Notice I didn't say "older." Thank you so much for hosting me on the last post in my 20 stop blog tour. Great comments from your readers. I loved your post! You really hit the nail on the head with the qualities of a swoon worthy hero. I can hardly wait to read your book and hear more about the story of gabrielle and pierce.